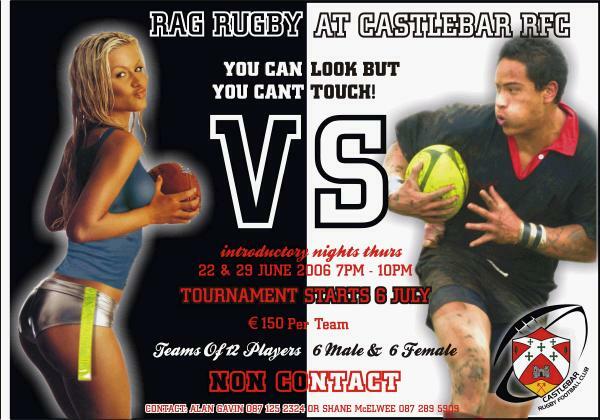 RAG RUGBY COMES TO CASTLEBAR! Rugby fans throughout the west of Ireland will not have time to rest this summer with the news that Rag Rugby, one of the fastest and most enjoyable aspects of the game, will be coming to Castlebar starting July 6th. The emphasis of the game is to have fun with little or no contact and is suitable to both males and females of all ages. The competition begins with introduction nights on the 22nd and 29th of June where players will be introduced to the game and the crack that goes with it. From there it will be on to the competition itself that begins on Thursday July 6th starting at 7pm lasting for three hours. Teams will be selected with 12 in each side made up of 7 ladies and 5 males with no more than two "rugby" players to each side. This is to give everybody a fair chance and to take an element of competition away from the game in which enjoyment and simply having a good time is the important aspect. Teams are currently joining from all over the area but if a player is interested in playing and is not with a team, then they are welcome to attend the introduction nights where they will be teamed up. The entry fee for each team is one hundred and fifty euro, which covers entry into the competition, and this is also seen as a great chance to get fit, have fun and generally have a good time. The competition comes to an exciting climax with a finals day that will have entertainment, a barbecue and lots more going on as the summer comes to an end. There will be updates on the tournament throughout its duration through the media and online with up to date league tables and other information. For further information on the Rules, The castlebar website www.castlebar.ie has a full run down on the do�s and don�ts of the game. Further information can be obtained by calling organisers Shane McElwee on 087 � 2895909 or Ray Blake on 086 � 8190775 who will only be too glad to help.